Download all of the tools, templates, and scripts mentioned in the book. 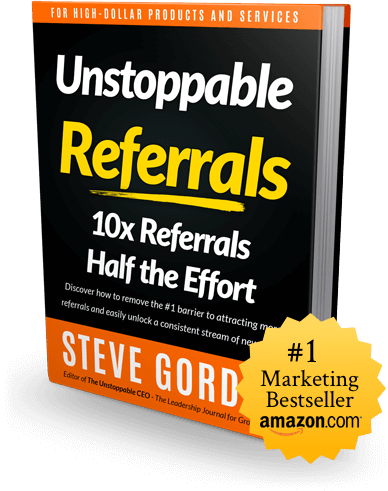 When you see “10x Referrals, Half the Effort,” you desperately want to believe it. Then common sense and experience creep in through the back door of your mind, telling you not to get your hopes up. Such a statement could only be hype. In the case of Steve’s book, you can believe the claim. This is a very quick read with highly actionable content. The author provides you with a step-by-step blueprint on how to go about gaining customer referrals. If you’ve struggled to gain referrals from your previous and/or existing clients then you need to read Steve’s book. Download the free book Resources today! Copyright © 2014-2018 Unstoppable CEO Press. All rights reserved.